Real Lives: Eleven Teenagers Who Don't Go to School by Grace Llewellyn. Author of the popular Teenage Liberation Handbook, Grace Llewellyn edits this book of firsthand accounts written by teenagers about the things they can do when given the opportunity. It is reassuring for parents and kids to hear the voices of "real-life" teenagers. It is also fascinating to read all the different teenage stories and see the variety of interests they have and the different educational experiences they've gone through. We have the Eleven-year anniversary edition, with updates from all the writers). First published in 1993; updated in 2005. Includes index, appendix, recommended resources, and black & white photographs. In 1993, eleven homeschooled teenagers described their lives in rich detail, and Real Lives quickly became a homeschooling classic. Erin's favorite teacher was her horse Nick, blind in one eye. Kyla flew to South America in September of what would have been her senior year alone, except for her mountain bike. Jeremiah and his sister Serena published a newsletter on peace issues. Patrick, who hoped someday to design video games, had spent the past few years compiling portfolios of his writing and artwork. Rebecca worked at homeless shelters and, through Habitat for Humanity, built houses for people in need. Anne tended honeybees and plucked a bluegrass banjo. Ayanna kept pace with 50 pen-pals mostly in Africa while Kevin talked with people all over the world on his ham radio. Amanda performed with a violin quintet and worked through the mail with her writing mentor. Vallie answered questions at a marine science center; Tabitha answered the phone at a crisis line, and helped midwives at births. Now those eleven homeschoolers have grown up and engaged the territory of adulthood, college, and career and the new edition of Real Lives includes updates from all of them. From gaining admission to an Ivy League institution without taking the SAT to crafting a simple life centered on writing and gardening, they tell where life has taken them and where they have taken life, and offer hindsight and advice for others choosing to learn outside of school. 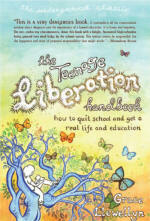 This is great reading for teenagers (schooled or unschooled), homeschoolers of any age, educators who want to broaden their understanding of how people learn, and anyone who is curious about what homeschooled kids think of homeschooling--and what those same "kids" think eleven years later. Lots of black/white action photos! Paper, 320 pages. Updated & revised edition.